And my famous Stentor piston with the baffle 90 degrees out. The part looks great on my wife's desk as a paper weight! I guess a lot of us have at some point made one of these bent conrods. If I post all my boo-boos...we'd be out of server space. 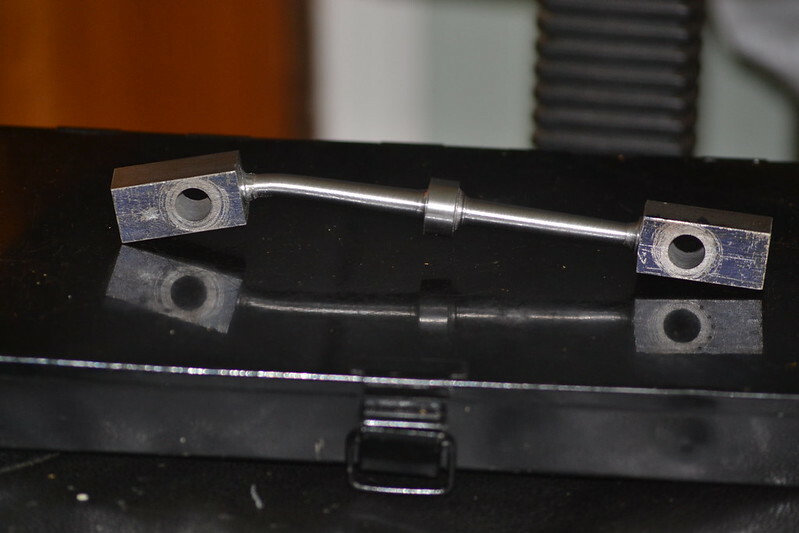 Two cylinder blocks that got slung out of the vise. One cylinder block with the cylinder in the wrong place. One con-rod with too much taken off one end. I also have other "trial pieces", too numerous to mention, that end up being flung in the scrap bin usually without pausing to take a picture. I do sometimes publicise my errors but generally they are a result of my own stupidity and I feel that others would not learn anything from seeing the results of that. 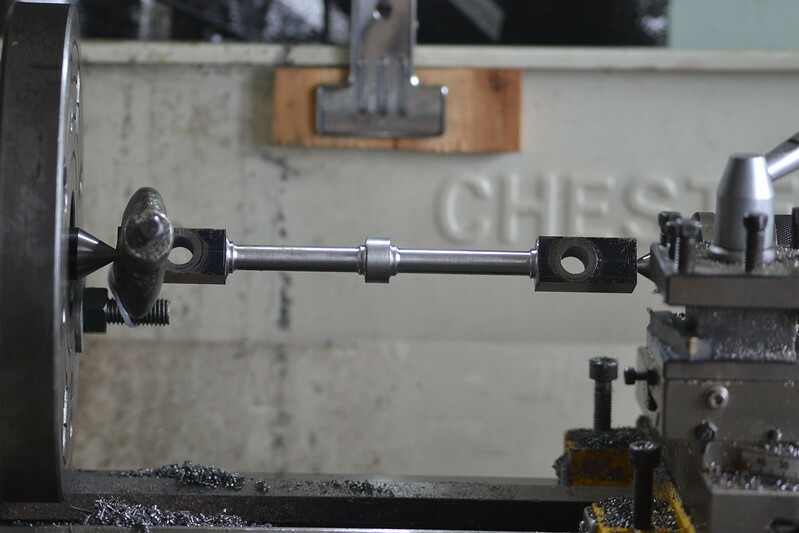 The picture below shows a mandrel with a centre machined on the end and 2 holes for the rod fixing bolts to fit into and transmit the drive. The other bit is the reprofiled rod after the thought that "This is going well. I'll take a deeper cut." crossed my mind. "This is going well. I'll take a deeper cut." Most of my boo-boos occur after thoughts like "Is that right? ", "What's that sound? ", "Something seems off. ", "Huh? ",...and I ignore myself. I still haven't accepted the fact that my inner me is smarter than me. My inner me needs to be more assertive. Most of my bigger boo boos got hidden in the bilge of rc boats as ballast (and I have a bunch of boats!) or cut down for smaller parts. What happens when you type in a G00 Rapid Move command instead of a G01 controlled feed rate move? Looks like the make-a-spring command! Bill, in that state it looks like a logo for the Poo Poo company! Bad Behavior has blocked 12644 access attempts in the last 7 days.